All week it has been cold. And rainy. And windy. It felt like the first full week of autumn, where the wind became a chill, rather than a summer breeze. When I would go out for a run at night, the air had the musky, wood-smoke smell of fireplaces burning off the pitch from last winter. Convinced that summer had come and gone, my body began to stoke up its metabolism for the rich flavors of fall. Friday night I went to Wegmans and picked up everything I would need to make a rustic pate de campagne. I woke up Saturday morning with a grand anticipation for savoring my first cup of coffee on the porch and enjoying the chilly air. Reaching for my favorite orange mug, I felt oddly...warm. Out on the porch, it was about 67 F. The weather channel predicted a high of 76 F for the day. Hmmm. For the first time this year, I wondered why it was a beautiful summery day. Despite all of July and most of August being rainy and cool, the one day I plan an autumnal feast I get beach-going weather. Thankfully, God has given me the fortitude to consume pate in all seasons. This is your basic pate de campagne, or country pate. A blend of ground pork, calves liver, onions, garlic, and herbs, all bound together with bread soaked in milk, brandy, and gentle cooking in a water bath. 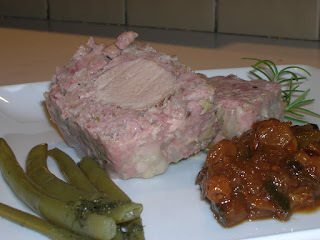 To make it a bit more interesting, I decided to try putting a pork tenderloin inlay within the pate. The basic idea is to create some geometrical visual interest, similar to the look of a slice of sushi. Except instead of a slice of tuna surrounded by rice, I would have a panopticon of pork within a block of liver and ground meat. 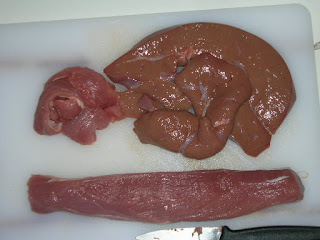 To add a bit of flavor, I deeply seared the pork tenderloin to a golden brown before placing it within the pate. 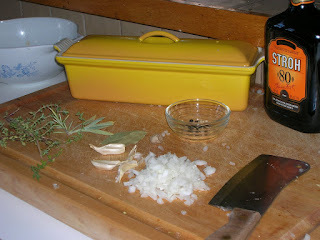 Rosemary, white pepper, nutmeg, cloves, and bay rounded out the taste. Packed into my terrine, I baked it for about 75 min at 300 F until it hit 160 F on an internal thermometer. This is surely the most beautiful pate I've made. Along with having the pork tenderloin running through the center of the pate, the meat also stayed a beautiful pink. I kept the appetizing pink color by using a small amount of sodium nitrite with my seasonings. To add a bit of contrast to the rich pate, I served it with garlicky pickled green beans and a dollop of the River Cottage Chutney. I made this chutney earlier in the summer, with a bit of hesitation. Rather than being mostly fruit based, Hugh's River Cottage Chutney was mostly vegetable based. Zucchini, green tomatoes, bell peppers, onions and only two tart apples made up the body of this chutney. But I should no better than to doubt, as his chutney was the perfect balance of sweet-sour, savory, and spice. Now I can't wait to find more uses for it. So while a bit out of season, it was still a delicious day. And besides, there's a pate for all seasons. Dessert, however, was even more autumnal-themed. 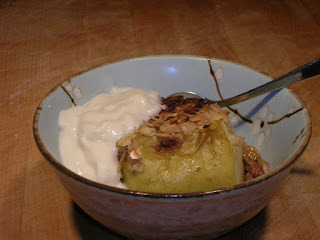 Baked apples stuffed with walnuts, raisins, oatmeal, brown sugar, and cardamom, served with vanilla yogurt. How's that for an October snack?